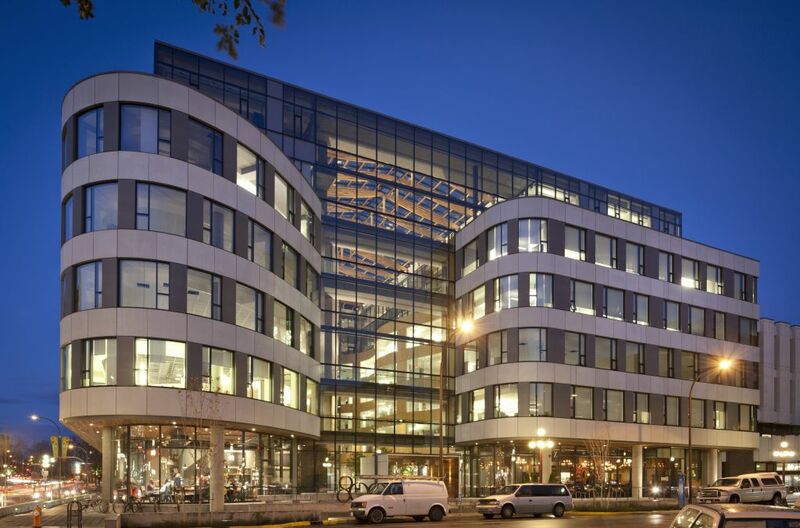 One of two Canadian winners in this year’s Precast/Prestressed Concrete Institute (PCI) Design Awards, Victoria’s The Atrium used ultra-high-performance concrete (UHPC). Photo courtesy Lafarge. A retirement centre and a mixed-use structure were the two Canadian winning projects in this year’s Precast/Prestressed Concrete Institute (PCI) Design Awards. The predominately U.S. competition had 28 winners from across North America. Along with a number of best-in-class awards, it recognized industry advancement, sustainable design, and the best all-precast concrete structure or solution. “These outstanding projects were singled out for extraordinary design and their innovative use of precast concrete to meet tight schedules, sustainability guidelines, and other project goals,” said jury member Craig Smith, AIA, principal at Loebl Schlossman & Hackl. “These projects highlight the esthetic versatility and design flexibility of precast concrete systems. The Best Retirement/Assisted Living Centre went to Résidence Le Saint-Jude in Alma, Que., designed by EPA Eric Painchaud Architects. Precaster for the project was Bétons Préfabriqués du Lac, and the engineer was Gemel Experts Conseils. Precast concrete in varying shapes, finishes, and colours make up the entire building, including floor slabs, insulated wall panels, and stairs. Winning Best Retail/Mixed-use Structure was Victoria, B.C.’s The Atrium. (For more on this project, see the article in Construction Canada magazine.) Designed by D’Ambrosio Architecture + Urbanism, with precaster Lafarge Canada, and engineers Fast+Epp and Stantec, the seven-storey building is the first in North America with an exterior precast cladding system made with ultra-high-performance concrete (UHPC). Entries were accepted in two primary categories: buildings and transportation structures. To qualify, the structure had to be substantially constructed using precast concrete. For buildings, this includes precast concrete cladding systems (architectural precast), structural systems, or combinations of both. For transportation structures, this includes all types of bridges and other related components for which the precast concrete has been manufactured in a permanent precast concrete manufacturing plant. Additionally, the precast concrete used in the project must have been produced by a PCI- or CPCI-certified precast concrete producer. Projects had to be located in Canada, the United States, or Mexico, and must have been completed within the last three years.